The wheels are in motion! Development for tiicoon is well underway and a first prototype is available for try-out. Yes, that’s right, tiicoon (pronounced /taɪˈkuːn/) is the name of the new multiplayer city simulation. 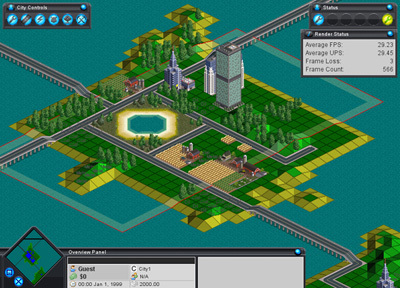 The prototype allows to construct a city with some of the basic infrastructure. There is no game-play as of yet. The game will feature three type of players. You will be able to take the role of a mayor (city), business or become a god. Details are not finalized as of yet. As of now, mayors will be able to build the city with its transportation and infrastructure. Businesses construct housing, farming, industry, mining and commerce. Gods will have a variety of options to influence the city and business players. The game will either be programmed for turn-based or real-time multiplayer, or both. Please visit the forums to comment and feedback. Let us know what you would like to have implemented?